Cilia are the cytoplasmic extensions arising from basal granules lying below the cell membrane. The function of cilia is to move particles, free cells or mucous in a specific direction over the epithelial surface. The surfaces of some hollow organs such as fallopian tubes, bronchioles and small bronchi are lined with ciliated epithelia. Centriole: A structure in an animal cell, composed of cylinders of microtubule triplets arranged in a 9 + 0 pattern. An animal cell usually has a pair of centrioles, which are involved in cell division. Cilia are thread like appendages which project outside a cell from a basal blepharoplast granule, and are covered by plasma membrane. Their diameter is 0.5μ. 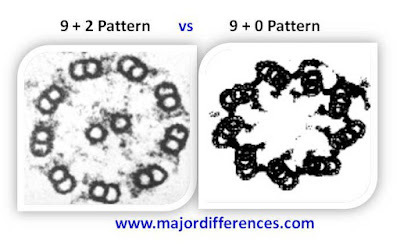 Centrioles are two small rod like bodies, lying at right angles to each other within the cytoplasm near the nucleus. Each is 0.15μin diameter and 0.5μlong. They have no bounding membrane except a cytoplasmic matrix. Each cilium shows 9 peripheral groups of doublet microtubules arranged in a circle, and two singlet microtubules in centre enclosed in a sheath. This is called 9+2 pattern. Each cetriole has 9 peripheral groups of triplet microtubules, without any central microtubules. 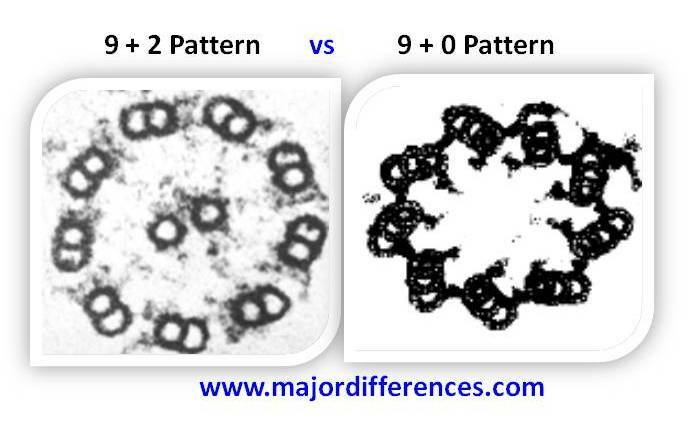 This is called 9+0 pattern. They are not self duplicating units and do not have DNA or RNA, but contain tubulin proteins and dyenin. They are self duplicating units and contain DNA or RNA. Function: Cilia is as organ of locomotion of cells by their sweeping or pendular vibrations. Function: They give rise to basal granules of cilia and flagella, and to produce spindle apparatus at the time of cell division. That table was immensely helpful; you made this very straightforward. Thanks.